It's a rather sweet name for a fierce little plant. The sundew is a spiky, carnivorous plant that grows well in terrariums in the home and in wet, swampy areas around the world. Although it looks dainty and sweet, it's a killer in disguise. It can take over in marshy areas that are rampant with flying insects. The sundew can grow in difficult situations and adapt to its surroundings. They come in as wide a variety of colors and shapes as their fascinating capabilities. It's a rather fascinating little plant. The dainty, spiky exterior of a sundew belies its true nature. Sundews are carnivorous and can take down flying insects or crawling bugs that find their way onto their sticky surface in seconds. There are more than 190 species of sundew found around the world. A sundew species grows on every continent. The sundew enjoys really wet areas that are thick with insects. It prefers to live in swampy areas, bayous, marshes and bogs. The drosera is one of the largest genera of carnivorous plants. They lure, capture and consume insects via reedy glands that cover their leafy surfaces. The sundew sets up in soil that isn't rich in nutrients. For this reason, the sundews consume insects to supplement its need for nutrients. Two of the more interesting looking sundews are the Drosera intermedia and Drosera aliciae. The Drosera intermedia is enjoyed for its oblong and tentacle-like stalks that reach toward the sky with tiny spikes that branch out from each slender stem. The Drosera aliciae is commonly grown in household terrariums and moist pots on kitchen windowsills to catch pesky fruit and house flies. Definitely considered to be one of the easiest and more attractive sundews to grow in a home terrarium or in an outdoor garden in humid areas, the Drosera aliciae has all of the attractive qualities of this large, carnivorous species. The sundew flower colors can range from a pale yellow to a pastel lavender. They grow vertically from the base. 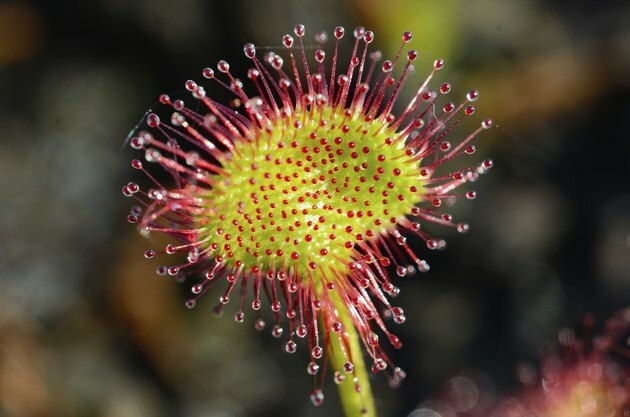 The more food to which the sundew has access, the better chances it has of producing its dainty flowers. The flowers appear like pearl along a tall, thin stem that rises delicately from the spikey, sticky base. The sundew flowers have a short window to bloom, just December through January. A sundew flower contains miniscule seeds that can be gathered and germinated in moist soil in small, covered pots. The sundew responds to the slightest vibration or touch, wrapping its leaves around prey that happen to land in its sticky arms. This is called thigmonasty. The thigmotactic abilities keep the plant healthy for decades as it grows and sheds its older spongy leaves or tentacles. Flying and crawling bugs are attracted to the sticky dew on the leaves of the plant. Once they have landed, the plant wraps its leaves around the prey. The insect either suffocates or expires from exhaustion. It can take up to 30 minutes for the insect to be fully engulfed for the showy cape sundews. The Drosera glanduligera are much faster, wrapping their snap tentacles around prey in mere seconds.